For Celeste Blackmoore and her sisters, locating a hundred year old buried treasure in the gold mining ghost town of Dead Water sounds like an easy job ... until they find themselves facing threats from both sides of the grave. 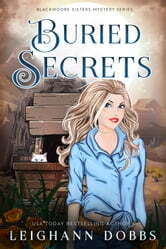 While dealing with a ghost who wants revenge, a sheriff who wants to lock them up and a thieving stranger who wants them out of town, the girls find themselves using their unique paranormal skills to investigate a century old secret that holds the key to the treasure. Throw in a hunky bartender, a shotgun toting old timer, a mysterious stranger from their past and, of course, their trusty cat Belladonna who always knows just where to look (if only the sisters would listen to her!) and the girls soon discover that looking for buried treasure can be deadly. In a town where no one, including the ghosts, are what they seem, can the girls find the treasure before they end up in grave danger? This is the fifth of these books that I have read and I think they get better. I am particularly fond of the continued appearance of 'Belladonna' I would enjoy having a cat like her. Enjoyed reading the fourth book in this series. Each book draws you in more. Couldn’t put it down. This is a cozy read that keeps you engaged from page 1 to the last page. Looking forward to the next book in the series.